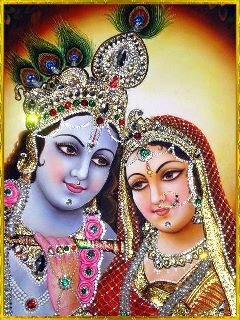 What we offer here is a collection of photographs of Krishna Deities and paintings or prints of Lord Krishna and His associates. Going through these many images can help us meditate on the pastimes of Sri Krishna or invoke higher states of devotion and spiritual consciousness by viewing and becoming absorbed in these pictures and prints. These are free the way they are and can be downloaded for personal use, and there is a wide variety of both high or low resolutions. Additional Prints or photographs of Deities of Lord Vishnu and Lakshmidevi, Lord Narasimha, Lord Ramachandra and Sita and Hanuman, Shiva and Durga, Kali, Ganesh, Murugan, and others, can be viewed through the link at the bottom of the page. There are four sections arranged on this page. Section One consists of the photographs, some of which are rare, of beautiful Deities from around the world. Section Two contains prints or paintings of the Deities in temples where photography is not allowed. Section Three contains paintings and prints of Sri Krishna in various playful pastimes. These are all set up so that you can go through all the photos one at a time like a slide show by clicking on the "next" button at the bottom of each page, or simply view the ones you want. Section Four are a few rare prints of Lord Chaitanya. NOTICE: These photos and prints are not offered for sale, but anyone can view them or download them onto their own computer. This is a small portion of the large collection of photos that I have of various beautiful Deities of Lord Krishna from around the world. Such Deities appear in most major temples, and some are quite significant. These photos are also especially nice for one's spiritual inspiration. The Deity is the Lord's special mercy to allow us to meditate on His spiritual form, even if we do not have the qualifications to see the spiritual atmosphere as yet. To observe the Deities in the temple, and allow ourselves to be seen by the Deity, is an exchange called darshan. Through this means, we also engage our mind and senses in focusing on the Supreme. Such darshan is totally unique to India for there is no other experience like it found in any Western religion. The Deities are most often made from either marble or brass, but other materials are used as well. They are made and prepared according to the standards and descriptions found in the Vedic references, called the Shilpashastras. Then they are installed in a ceremony which calls for their Lordships to appear within the Deities. However, what really calls the Divine to come forth and appear as the Deity in the temple or reciprocate with us is simply our devotion and love. When one exhibits love for God, the Divine can appear anywhere. Portable Altar Photos--These are sets of portable altar photos with the Parampara of the Gaudiya gurus below a photo or photos of the Deities of Vrindavana, namely Gaura-Nitai, Krishna Balarama, and Radha-Syamasundara, or a larger photo of Radha-Syamasundara. These have been scanned at high resolution, so they may load slow, but once downloaded to your computer, they can be enlarged and printed to the size you want, or folded and taken with you wherever you go. Krishna Photo # 32 Budhanilkantha, Vishnu, at Kathmandu, Nepal. Krishna Photo # 41 The beautiful Deities Sri Sri Krishna and Balarama, Vrindavana. Krishna Photo # 42 The most lovely Deities Sri Sri Radha-Shyamasundar, Vrindavana. Krishna Photos # 63 Here are the beautiful Deities of Sri Sri Radha-Shyamasundara in the Iskcon temple of Alachua, Florida. Krishna Photo # 65 A lovely photo of Lord Dwarakadish a Temple in Saiharikshetra, Aptaphata, Karnala, Dist. Raigad, India. This section contains a few prints of the Deities in various temples wherein photography is not allowed. Thus, such prints are often the only way to have a visual assistance of what the Deity looks like. Paintings of Krishna-lila, or the pastimes of Lord Krishna, are done in many different styles, often depending on what part of India they are found. They can be done on silk or cloth, canvas, on paper, thin pieces of marble, and they used to be done on thin slices of ivory before it was banned. Each of these mediums will provide the artists a certain level of refinement for details. Miniatures especially are often small paintings, but quite detailed. To get such details, the artist may even have to use a brush with a single bristle. The colors are often natural, made from various herbs or crushed and powdered precious or semi-precious stones. The mood of the painting is usually determined by the elements included in the painting, which are often based on pastimes described in the Vedic scriptures, or on the inspiration and devotion of the artist. The point is to invoke the same mood of devotion or inspiration in the viewer who simply sees or meditates on the painting and the mood therein. The following paintings are examples of some of these different mediums, and various moods and inspiration. I hope you will enjoy this little collection. Krishna Prints # 76 Several prints of Sri Nathji in various outfits. Lord Chaitanya was the most recent incarnation of God, and appeared in the place of Mayapur about 500 years ago. He was a covered incarnation in that He appeared in the form of His own devotee to show the process of devotional service, especially for this age of Kali-yuga. Because of that, He did not so clearly reveal Himself as a descended form of God. Nonetheless, His life and teachings were well documented by His followers. These prints exhibit some of that life and the ideal mood of love that He displayed for Lord Krishna. Chaitanya Print # 11 A close up print of Lord Jagannatha, Balarama and Subhadra as They appear in Jagannatha Puri. Here is Lord Chaitanya, Gauranga, seen with Lord Krishna in His heart.